Variations – Art Exhibition of Jindrich Degen captures the highlights of an art exhibition held by Jindrich (Henry) Degen in November 2013 at the Yurara Art Society gallery near Brisbane, Australia. Because of its nature, Variations has limited circulation. To preview or purchase the book, click on the above link or the image. 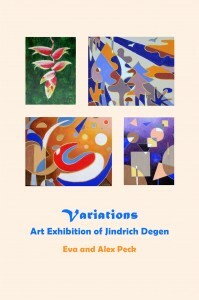 For Jindrich’s other art and art books showing his numerous and varied art forms, visit his website www.henrydegen.com. See also related art books Faces and Forms Across Time, Colour and Contrast and Artistic Inspirations. The following comments were written in the Guestbook. A great display and so versatile. Very talented – keep going! Very nice and good art. Jindrich’s artwork is impressive in its versatility. Also it lifts the spirit. Lovely to revisit the work of a very talented artist. Feel free to leave a comment on the book or Henry’s artwork here.